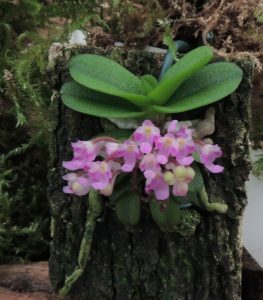 The smallest species we have from the Vanda family is Schoenorchis fragrans which comes from the Eastern Himalayas where it grows in warm lowland forest. We grow the species mounted and hung right in the roof of Warm Asia where it can really dry out between waterings. The flowers are long lasting and, not surprisingly, fragrant.